292 . . . Significant numbers of the Brazilians began to arrive in West Africa in the first decades of the nineteenth century. In 1835 an uprising of the black population - slave and free - in Salvador, Bahia, shook the authorities so much that they took measures forcing many ex-slaves to leave for West Africa. Local authorities placed severe restrictions on people of African descent, including fines and deportations of those who in any way were “suspected of trying to provoke slaves into insurrection." Under these restrictions, many freed Africans left seeking a more congenial life elsewhere. Many eventually came to West Africa, which they regarded as home. Thus, the Brazilian community in Accra, after whom a street is named (Brazil Street) in James Town, dates its arrival to this period (1836). Throughout the nineteenth century, more immigrants continued to come as they acquired freedom and money to pay their passage. The final abolition of slavery, which occurred in Brazil in 1888, provided another impetus for ex-slaves to migrate to West Africa. Many of those who had been sent to Brazil as young people nurtured the remembrances of their homes in Africa and longed to return. The total abolition of slavery opened the way for them to attempt to fulfill this longing. Many thus found money and boarded ships coming to the West African coast . . .
My essay (describes) the meeting in the border zone between African American tourists who return to mother Africa, specifically to Elmina Castle on the coast of Ghana, and the local Akan speaking Fanti who receive them. In 1993, there were 17,091 visitors to Elmina Castle; 67 percent were residents of Ghana, 12.5 percent were Europeans, and 12.3 percent were North Americans. An important and growing segment consists of blacks from the diaspora, and includes many African Americans. As part of the tourism development project, much effort has gone toward the rehabilitation of the historic castles and the construction of a museum in Cape Coast Castle. The increased attention has precipitated discussion over the interpretation of the castles, particularly over which version of history shall be told. What most Ghanaians want from tourism is economic development, including employment, new sources of income, better sanitation and waste disposal, improved roads, and a new harbor. While Ghanaians see tourism primarily as a route to development, the African American tourists have a different perspective. African Americans focus on the dungeons at the 500-year-old Elmina Castle because, understandably, the slave trade is of primary interest to them. Indeed, many African Americans come to Ghana in a quest for their roots, to experience one of the very sites from which their ancestors may have begun the torturous journey to the New World. It is for them a transition point between the civility of their family in Africa and the barbarism of slavery in the New World. For many African Americans, the castles are sacred ground not to be desecrated. They do not want the castles to be made beautiful or to be whitewashed. They want the original stench to remain in the dungeons. . . Some diaspora blacks feel that even though they are not Ghanaians, the castles belong to them. Balancing this sadness is the sense of strength and pride many African Americans feel at the recognition that their ancestors must have been strong people to have survived these inhuman conditions. Most Ghanaians, on the other hand, are not particularly concerned with slavery. Generally Ghanaians focus on the long history of Elmina, while diaspora blacks focus on the mid-Atlantic slave trade, which reached its height between 1700 and 1850. Ghanaians want the castles restored, with good lighting and heating, so they will be attractive to tourists; African Americans want the castles to be as they see them - a cemetery for the slaves who died in the dungeons' inhuman conditions while waiting for the ships to transport them to the Americas. Ghanaians see the castles as festive places; African Americans as somber places. Which story shall be told? Vested interests and strong feelings are involved. The attention of diaspora blacks to the dungeons and the slave experience has the potential consequence of introducing into Ghanaian society increased tension between African Americans and Ghanaians, and possibly a heightened awareness of black-white opposition, a sensitive and possibly controversial issue. . . The situation is full of ironies. When diaspora blacks return to Africa, the Ghanaians call them obruni, which means "whiteman'' . . . Many Ghanaians have told me that they consider some African Americans to be racist.
. . . an African American tourist who meets a Ghanaian may secretly wonder, Did his ancestors sell my ancestors? Further, some Ghanaians, seeing that diaspora blacks are prosperous and educated, feel they were in a sense fortunate in being taken as slaves, because now they are economically well off and have a higher standard of living than the Ghanaians. African Americans too may ask, What would my life have been like had my ancestors not been taken as slaves but remained in Africa? 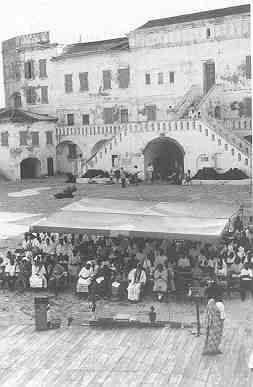 One Elmina resident, refusing to pay the entrance fee, stated that the castle and the land belonged to the Elmina people, so why should they pay an admission fee? Some African Americans also refuse to pay the fee, saying they didn't pay to leave here, so they shouldn't have to pay to come back. So who "owns" the castle? 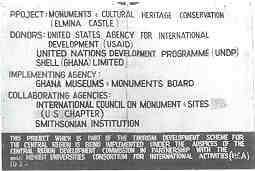 Who has the power to represent one of Ghana's greatest historical monuments? Tourism as Commerce Ghanaians generally welcome tourists but . . .
A final consequence of tourism is that the tourist interest in Ghanaian culture has led to an increase in Ghanaians' own interest in their culture. In conclusion, we ask again, who owns Elmina Castle - the diaspora blacks who left as slaves, the Elmina citizens and the traditional chiefs who remained in place, the USAID and other international aid agencies who support the restoration and provide the interpretive perspective, or the tourists to whom the castle has now been dedicated? 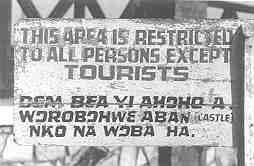 Figure 6: Sign on the grounds of Elmina Castle. Photo by Edward M. Bruner. This is a rhetorical question, but the castle has not been simply a passive place. 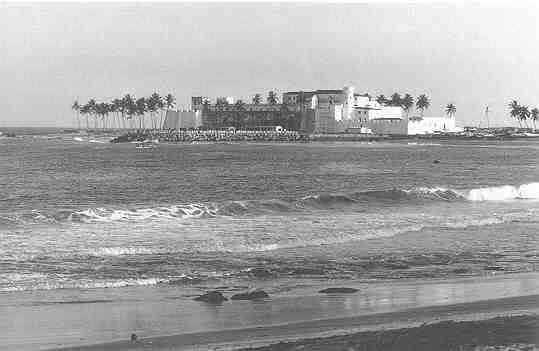 Elmina Castle may have been built initially as a European colonial intrusion on the Guinea Coast, but subsequently the castle has made its own claims to power and monumentality. Dominating the countryside, a massive structure on the edge of a humble fishing village, the castle takes on properties of its own and imposes its own meanings on the surrounding area. 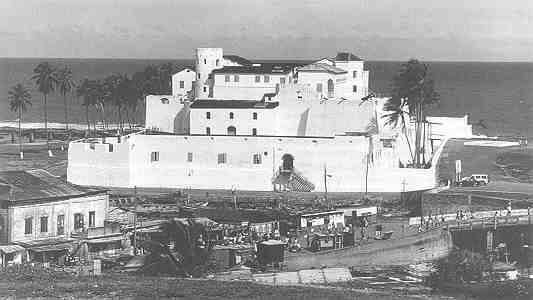 Elmina Castle is a bastion of power, a site to be struggled over, a transition point between the passage of goods and peoples from the interior of Africa to Europe and the New World. Old castles have long histories, stories of combat and battle, honor and degradation, beauty and cruelty, civilization and barbarism. Who owns the castles? Who has the right to tell their story? 134-5 Also significant in attracting other Muslims form the interior before the influx of the interior traders in the second half of the nineteenth century was the settlement at Accra of a sizeable number of liberated African slaves from Brazil. Some of them were said to have been received and accommodated by the chiefs of Accra, including Chief Ankrah. AA Brown gives the names of the following as accommodated by Chief Ankrah (they were either Muslims before or during slavery) Malam Aruna, Usuman Kangidi, Mamam Nassau, Peregrino, Zugger Mascino, Alu Mama and their Imam Malam Mama Sokoto. How many of these people were Hausa cannot be said though at least the Imam was. AA Brown has dated their arrival at Accra to c 1836 though he has given no indication as to how he arrived at the date. There is a considerably greater bibliography on returnees, including from Brazil, than in Parkvall's bibliography, and there is a lot of research currently underway on the topic. The leading authorities on the subject are Bellarmin Codo, Elisee Soumonni, but Kristin Mann's work on Lagos and Robin Law's work on Ouidah is also significant in tracing individuals. In addition to the sources listed by M. Parkvall on Brazilians on the Slave Coast, the most thorough is J. Michael Turner's dissertation, "'Les Bresiliens': the Impact of former Brazilian slaves upon Dahomey" (Boston University, 1975). Sylvain Anignikin, "Les origines du mouvement national au Dahomey, 1900-1939" (these de 3e cycle, University of Paris VII, 1980). Bellarmin Codo, "La Presse dahomeenne face aux aspirations des 'evolues'" (these de 3e cycle, University of Paris VII, 1978). In addition, my analysis of the economic history of Dahomey traces, if concisely, the role of Brazilians in economic and political affairs of the region from early 19th to mid-20th century. Last week, on March 14th to be exact, I got shot. I glanced at the cover of the Wall Street Journal and got shelled, hit hard with well-crafted propaganda. I know that’s a heavy word and as soon as you use it, people immediately box you into a safe, neat corner. They are less threatened that way. But paper (or digital) bullets are no joke. And they don’t take you out gangsta-style. They heat sink your brain and expand into unattributable hearsay, innuendo and subtle opinion-altering pieces of mind shrapnel. As a journalist and university lecturer who has visited and written extensively about Ghana, I am very familiar with Ghana’s complexities, both positive and negative. I also know unfair, inaccurate journalism when I see it. I personally know several of the people Zachary interviewed in his piece and like most journalists, know the formula for spinning stories. It mysteriously lies between the sly use of quotes, text and context, maligning by omission and, of course, corporate editorial & advertising mandates. The deadline driven, newsstand-rocking copy is then processed with assembly-line expediency. Just call it shake n’ bake journalism. Ready to eat anytime. Although there are truths in his story, it fails miserably to provide a balanced, objective view of the relationship between African Americans and Ghanaians or for that matter, shed any light on the many accomplishments of Ghana itself. Take for instance, the fact that the country recently held peaceful democratic elections and successfully handed over power to a democratically elected government after a nearly twenty-year regime. But is that newsworthy? Will that sell like controversy? The article has already created an outcry among progressive black folk everywhere. Take for example Zachary’s quoting of Audrey Gadzekpo, a Ghanaian newspaper columnist in Accra and women’s rights advocate. After setting a hostile tone in the beginning of his piece through assorted one-sided vignettes and quotes, Zachary drops in a quote by Gadzekpo to fortify his ill intentions. Here’s the quote: "The African role in the slave trade is not an issue in Ghana. People here are totally detached from any guilt or responsibility for their ancestors selling other Africans into slavery. It's like there's some collective amnesia." The thing is, Gadzekpo is making an objective analysis of the legacy of slavery and how Ghanaians have come to interpret or misinterpret it. Her quote, which was stated in the historical context of slavery itself, is innocuous, matter-of-fact. But when slyly inserted into a conversation about reconnecting to Africa, it is interpreted as injurious and uncaring. In fact, it is possible that the Zachary did not even interview Gadzekpo - who received some of her schooling in the US and returned to Ghana - for this piece but simply cut and paste this quote to suit his aims. If so, that’s lazy, unethical journalism to say the least. “I question the credibility of any reporter who quotes people out of context,” says Richard Osei, a Ghanaian living in San Francisco. “It is extremely disturbing to read the "negative" spin one reporter can put on a country, or for that matter, the entire continent. As usual, the reporter specifically chose to write this "riveting" article at the expense fueling animosity among Africans and African Americans and despite the fact that Ghana continues to make a historic democratic turn. Even the tone of the article potentially could fuel a downtown in Ghana tourism,” says Osei, an entrepreneur with his business sights on Africa. The WSJ piece also reports that Ghanaians see African Americans not as brothers and sisters but only as “dollar signs.” To highlight this view is one thing but to ignore the fact that all Americans, regardless of race, who visit marginalized nations are seen as “dollar signs” is to reveal an insidious agenda. Think about it. Who wins and who loses by this “divide and rule” strategy? The article also completely ignores issues of capitalism, imperialism and colonialism. But I’ll flip it to you another way. This divisive line of thinking is tantamount to a camera zooming-in on two people bickering over a fender bender at a busy intersection. But if we pull the camera back for that all-telling long shot, we see the real deal: the damn traffic light is broke. Who else, but America, is directing the world’s traffic? They say the first basic rule of propaganda is to deliver deceptive information through a generally accepted, “reliable” source. But this one-sided, divisive, racist, anti-black, anti-Africa article ties a more efficient lynch knot than the Klan could have ever dreamed of. It’s so transparent it ain’t even funny. In the sixties, the FBI’s Counter Intelligence Program (COINTELPRO) used misinformation and espionage to weaken black political resolve. Today, it seems most corporate newsrooms, largely still devoid of representative percentages of people of color and beholden to dollar deadlines, are creating more havoc in the black community than J. Edgar Hoover could’ve ever concocted himself. The writer crafted the following lead for his article: “Kwaku Sintim-Misa, a popular comedian here, likes to tell a joke about the African-American who emigrates to Ghana. "Brother, I've found my roots!" the African-American crows. A local shakes his head, wondering why anyone with a coveted United States passport would choose to move to Ghana. "Move to the Motherland?" the Ghanaian cries, "I want to escape the Motherland. "” And of course nowhere in the piece is there any mention of the sobering hows and whys out of which such a joke could be created in the first place. But hey, I love a good, politically incorrect joke anytime but come with something stronger. Make me wince. Perhaps this is all the writer could cull from the brother’s act to suit his needs. Don’t get it twisted. A romantic view of Africa (or America, for that matter) just won’t cut it. We owe it ourselves to be as constructively critical toward Africa as we would with our family members. I truly believe the blood of the universe is on the side justice in Africa and joining in the struggle to understand our (all people of African descent) relationship to the continent is what time it is. Has been. White Supremacy, capitalism, neo-colonialism and other assorted schisms aside, it really ain’t that complex. Either you feel connected to and love black people everywhere or you don’t - straight up and down. Surely Martin Luther King, Jr., who gave a speech of brotherhood at Kwame Nkrumah’s inauguration in Ghana in 1957, and W.E.B. Du Bois, who spent the last years of his life in Ghana and is buried there, would charge us to think higher, broader about Africa. By learning to approach the media with more sophistication - whether when reading a cover story, being interviewed, or forwarding that hot, “unbiased” and accurate email to others- we can always choose to be the players instead of the ones gettin’ played. Ralph A. Austen and Kenneth Warren (eds. ), The Atlantic Slave Trade in African and Diaspora Memory. Duke University Press, ca. 2002. Newbury, C. W., The Western Slave Coast and its Rulers, Oxford, 1961. Verger, Pierre. Bahia and the West African trade, 1549-1851 Published for the Institute of African Studies by lbadan university Press,.1970.
. . . I traveled to Ghana to conduct research in the historic castles and dungeons of Cape Coast and Elmina. . . . I went there to study how the curators of these sites reconstructed the history of the slave trade, and how visitors interacted with the history exhibitions and the physical environment. Specifically, I wanted to understand how visitors formulated ideas about remembrance, cultural identity, and heritage in the space of the monuments. . .